Our latest release, The Flight and Fate of the Horsemen, is available now from Dark Holler Arts. 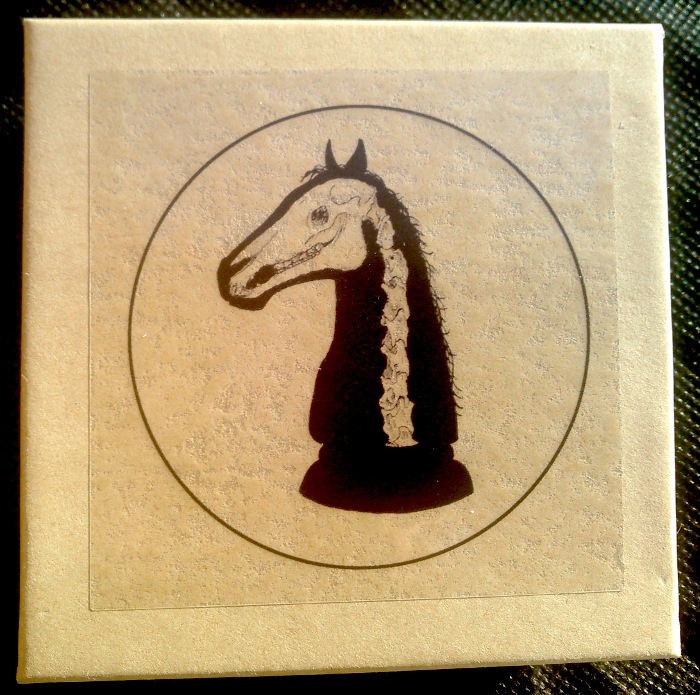 The Flight and the Fate of the Horsemen presents over 75 minutes of new music from Stone Breath – taking the form of 4 long songs spread over 4 separate 3″ mini-CDr discs and packaged in a small kraft box with info/lyrics and a hand stenciled patch (on either black or green fabric – randomly inserted). Post-apocalyptic in theme, these longer more experimental drone-folk pieces call to mind the Devotional songs from A Silver Thread to Weave the Seasons – showcasing multiple instruments and improvisation mixed with arranged sections. All music will be exclusive to this box set for one year and one day from the release date (January 6, 2016). This music will not be available to download until January 7, 2017. At that time we will issue digital codes at request for any who have purchased the physical versions. The first 33 copies ONLY will come with an extra card-shaped mini-CDr with another (shorter) song, Within the Falling Sands (in its own signed and numbered cover, but it fits in the box as well). This song will remain exclusive to this edition of 33 until the digital release in 2017. Since 1995, I have been writing, recording, and releasing acoustic music as Stone Breath. In that time, I have seen many changes come to the music industry – for good and ill. Before crowd-funding became widespread, I ALWAYS considered every single person who purchased anything Stone Breath released as a patron. Whether purchasing a single song via bandcamp or the entire physical catalog, they are patrons. I never much cared for the word “fan.” I feel like it somehow places the artist “above” the listener and I have never felt that way. Stone Breath is lucky to have people who care to listen – and we, as a band – appreciate every ‘ear that hears.’ So, I want to thank all of you who support us at any level. You are all patrons and you are all appreciated. Who is listening? I know some people are, and I try to never take that for granted. Stone Breath has released albums with labels all over the world, but our first release, and most of our releases since, have been done on our own Hand/Eye label. We are currently in the process of writing and recording TWO new albums for (hopeful) release in 2016. Since recording Children of Hum, I have been hit with many unforeseen expenses. Some of these are of a more personal nature, but many are directly related to recording and running the record label. We’ve always recorded Stone Breath ourselves (o I how wish we could afford time at other studios! ), and we are now working with a selection of broken microphones, borrowed equipment, and aging hardware. My great fear is that at some point we will lose part or all of a new album before I could get it mixed, mastered and ready. To me, it already feels like it has been too long since our last full-length and starting over would just delay it further. Besides this there is, of course, the expenses of producing a new album (or 2) – printing, CD replication (I doubt we will be able to afford vinyl), shipping, and the unpredictable state of the music industry. Getting closer to the point, I am hoping there are some people who have the means to provide a little more patronage than normal. It might not fix everything or pay for all of the manufacturing – but it will help. • A credit as producer (in print and elsewhere) on the 2 Stone Breath albums we are in process of writing/recording now. • The Flight and the Fate of the Horsemen box set (sent NOW) – along with the bonus Within the Falling Sands mini card-shaped CDr – IF you are within the first 33 people to order (there are only 33 copies total of Within the Falling Sands available for both the PRODUCER PACKAGE and the standard edition of the box set together). • BOTH of the in-process Stone Breath albums as they are released. • A “sneak peek” of the new albums in the form of a CDr with demo/rough mixes of some of the new songs. Some of these will get remixed or added to and find their way onto the new albums – others will get completely re-recorded, so these mixes may be the only record of these performances. This will be sent NOW with the Flight and the Fate… box set. • One piece of original art/illustration from the upcoming albums – probably NOT the cover art (though maybe) – the choices will be offered on a first-come first-serve basis according to what is available at the time. Should there happen to be more PRODUCERS than available artwork, I will make original art available from past releases or offer art from future releases. PRODUCERS who are interested in ephemera relative to the new albums (a page from my sketchbook perhaps or original handwritten lyric sheets, etc), should let me know. That sort of thing could easily make its way to you as a bonus. Lastly, I know not everyone can afford this package. Maybe no one can? Please know that I truly appreciate whatever you CAN do – great or small. Thank you!